A Google Webmaster Help thread has Googler, John Mueller saying that the Content Keywords report within Google Webmaster Tools does not represent how Google understand the relevancy of your web site. 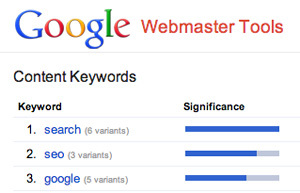 The keywords shown in Webmaster Tools are based on the keywords we find when we crawl your pages. They are not representative of how we view your site's relevance in web-search, it is purely a count of words from crawling (so if you see some words there which are common on your pages but which you find irrelevant, I wouldn't worry about it). If you remove those pages from your site, the next time we attempt to crawl and index them, we'll drop those keywords from our records -- and with that, over time, from Webmaster Tools as well. The Content Keywords page lists the most significant keywords and their variants Google found when crawling your site. When reviewed along with the Search Queries report and your site's listing in actual search results for your targeted keywords, it provides insight into how Google is interpreting the content of your site. If this report shows how Google is interpreting the content on your site, shouldn't that help determine relevance? Maybe we need a bit more clarification on the topic. I know what John is saying, that this webmaster shouldn't worry but really? The content keywords report is not a representative of how Google determines your site's relevance.